Once you’ve had the time to purchase the right crossbow, it’s time to think about additional accessories that you might need. Although the majority of crossbow packages come with bolts, you might be in the market for a set that offers more penetration and reliability than the stock ones you’ve received. The Carbon Express PileDriver Crossbolts are impressive in terms of penetration and velocity, giving you exceptional power while hunting. Similar to any other package of bolts that you come across, the main purpose of the Carbon Express PileDriver Crossbolts is to give you superior penetration, and they surely do. These bolts are specifically designed to offer a higher level of versatility, dependability, and ease of use than other designs on the market, which is what makes them a top-tier choice. The heavy carbon gives off an illustrious feel meanwhile the spine consistency gives you impeccable performance with every shot. You’ll never have to worry about broken or deteriorating bolts affecting your hunting ever again. In an effort to give avid hunters a more definite kill, the Carbon Express PileDriver Crossbolts offer plenty of unique aspects that other bolts don’t. The first thing you’re going to notice when you load up your crossbolts for the first time is that they are created for the everyday hunter. You won’t have to worry about any flaws in their design, including their aesthetic appearance, which makes them the perfect addition to your existing hunting gear. You’re also going to appreciate the durability of these crossbolts when compared to other models, which is ideal for individuals who have the tendency to shred their bolts after a couple of uses. You’ll finally be able to invest in a set of crossbolts that will last you over multiple hunting trips without worrying about splintered vanes or poorly constructed nocks. As the Carbon Express PileDriver Crossbolts aren’t a part of a crossbow package, you’re not going to receive any additional accessories with your purchase. However, they are the ideal accessory for people with an existing hunting setup, or, as your first purchase before you settle on a specific crossbow. Heavy carbon construction: Created entirely out of a high-quality carbon, these crossbolts are one of the most prestigious in the entire Carbon Express lineup. The carbon gives the perfect amount of power and provides the highest amount of kinetic energy possible. Spine consistency: During the manufacturing process, these crossbolts are put to the test in an effort to make sure the spines are consistent along the entire shaft of each arrow. This helps to make sure that they travel further and have pristine stopping power when fired. Improved accuracy: Compared to other Carbon Express bolts, you’ll find that the Carbon Express PileDriver Crossbolts are designed for heightened accuracy as well with the help of the consistent spine. Every shot that you take will be more accurate than ever before (+/- 0.004”), truly helping you to shoot better. 20” length: Measured from the nock opening to the end of the insert, these crossbolts are 20 inches in length. High grain count: Without the heads attached, the bolts weigh in at 350 to 353 grains and with the heads, they range between 450 and 453 grains. With so many different types of bolts on the market, it can seem relatively impossible to know which crossbolts are the best for your hunting gear. In comparison to the Carbon Express PileDriver Crossbolts, the Barnett Outdoors Carbon Crossbow Arrows offer a couple of varying details that may prove to be more beneficial depending on your gear. 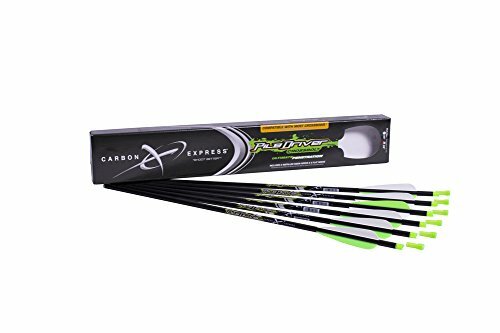 Included field tips: The first main difference between the Carbon Express PileDriver Crossbolts and the Barnett Outdoors Carbon Crossbow Arrows is that the Barnett arrows come equipped with field tips, whereas the Carbon Express bolts do not. You’ll be required to purchase any additional heads depending on whether you’re doing target practice or heading out on a hunt. Lighter weight: Another thing that you’ll notice is that the Barnett Outdoors Carbon Crossbow Arrows have a lightweight feel to them, whereas the Carbon Express bolts are slightly heavier. The total grain weight for the Barnett arrows is around 13.78 grains per inch on a 20-inch arrow and if you’re used to using lightweight arrows, these might be a better option for you. Apart from those two differences, both products are reliable choices, however, the Carbon Express PileDriver Crossbolts offer superior performance and longevity when used regularly. As rule of thumb, the number one thing that you should never try to buy as cheap as possible is your bolts. Even with the most superior crossbow on the market, poor bolts will result in poor performance, which is why the Carbon Express PileDriver Crossbolts are your best bet. They come equipped with everything you could ever need and offer a higher level of stability, reliability, and accuracy than any other set of bolts on the market. Above all else, they give you bone-crushing power that will penetrate absolutely any target that you set your sights on, which makes them much easier to use.